The majority of Microsoft software products have a 30-days trial in order to let the user try them for free. This allow users to see the value of the product and if they have been happy with it, they might consider paying for a license. However, spending hundreds of dollars is big problem for people having very low incomes, particularly in some of the poorest regions. If you are students/teachers and your school is part of the program, you will have a chance to use most Microsoft products at no cost. And if you are not a beneficiary of this program, using KMS method is a perfect solution you can consider. In today’s post, I will go into detail on how to download and use Visio, Project (2016/2019) without product key. First of all, you can download the latest version here if you dont have it already. Because it is stored as an ISO file so once your download completes, you have to extract it. Then just run the setup file to begin installing like you normally would. After successful installation, you will get be enrolled in a 30 day free monthly trial. When the trial ends, the most important features will be disabled and you have to purchase a license key to continue using the service. But what is really amazing is that you can easily get a free 6 months license by using KMS method. Importantly, you can renew the license easily when the period has expired (*). Just follow the instructions below exactly and make sure your internet connection is active. 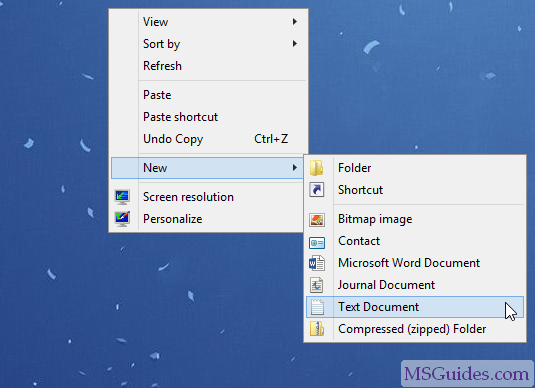 Step 1: Copy the KMS code into a new text document. Note: You need copy the appropriate code for your product. Step 2: Paste the code into the text file. 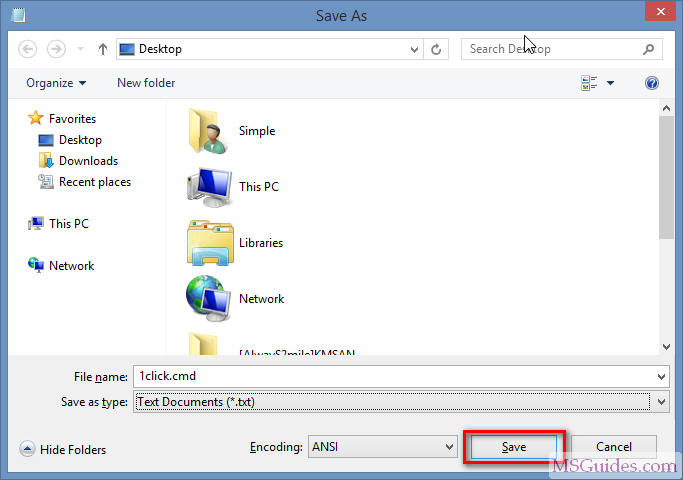 Then save it as a batch file with cmd extension. (eg “1click.cmd”). Step 3: Run the batch file with administrator rights. Check the activation state again. (*): KMS license is valid for 180 days only. But it will be renewed automatically before the expiration date if you are online. However, you can renew your Office manually anytime (even when its expired) by running the cmd file again. i m trying to activate visio pro 2019 using u’r script but failed. i downloaded the installer from the link you provided. I got several “connection to my KMS server failed” error, and at the end the script stated “Sorry! Your version is not supported. Please try installing the latest version here: bit.ly/odt2k16”. i installed office 19 but when i want to install also ms project 19 it says about couldnt stream …. ? Works for Sure..100%. You are my Saviour. You are master and a champion… Oh my god.. Your simple trick worked, Thank you so very much… Keep it up Boss!!! YOu are a champion.. you made it possible for me to use office word power point and excel. otherwise i could never afford it..
but MS Project says: This product is not licensed! It does not work… at least not anymore. Hi Guang, great job, well done. But I did initially have an issue with a warning that your script for Project 2016 could not fine a path “/root….” and just hung there. I tried several times but then tried the script for Project 2019 which works! All good now but I thought I’d flag this for you. My OS is Windows 7 Enterprise. Hi. Thank you very much for these tips and codes. Can I just ask for the activation process/code of the MS Visio 2019? This thing actually works! Thanks! Thank you for the great effort. Where do I download Visio 2016? it doesnt work for me. i dont know what im doing wrong. PLEASE HELP!! wow good job this actually works! so you are running your own KMS server? it is only valid for 180 days correct? how are you keeping this project funded? Thank you so much mate, honestly thought this was a scam. Didn’t work the first time I tried it however, the second time worked a treat. Thank you. Thanks a lot. It works, my Visio 2016 has been activated by your code. Please keep it up. At first i thought this was a virus and was a bit skeptical but after getting myself to use it, it actually worked!! Thanks man! Hi, I tried your step by step guide and it did not work. I am absolutely shocked that this actually worked. I was 100% certain that this was going to be a scam or a virus but thus far it seems to be working perfectly. This is wonderful thank you for making it. I have 2 seats exhibiting a request for activation, after a year of running fine. We purchased the 2 seats over a year ago, and had no problems. Now all of a sudden, we have a problem, and can’t use our software we purchased for $300 per seat. I ran your code from a batch file, and it worked. It is now allowing us to use the software we paid so much for. I talked with MS tech support, and they wanted to charge us $149 each to fix the problem they said was an infection. I’m very thankful for your help! excellent programming! 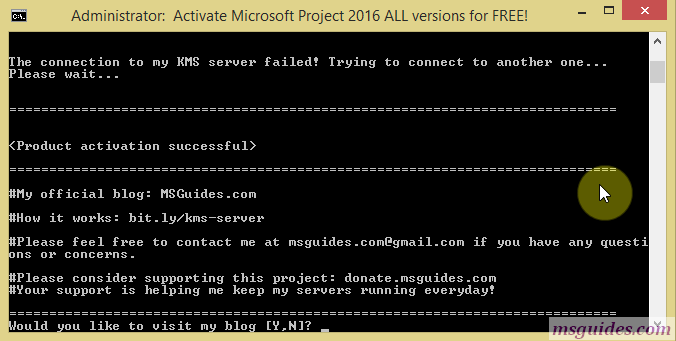 First, I’d like to thank you for the great public service you are doing publishing your guides and running a KMS server to support them!! 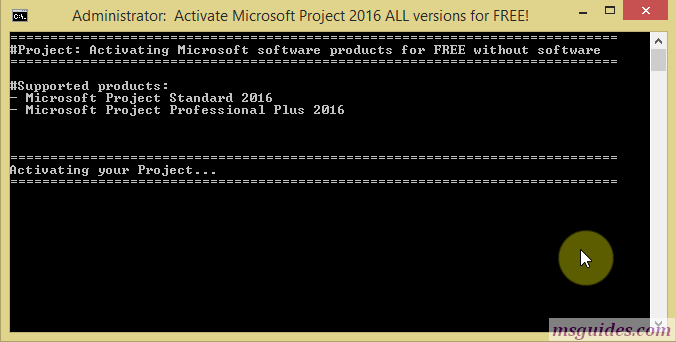 I activated Office 2016, Project Pro and Visio Pro using your code…thank you! My hard drive started showing signs of overheating and I imaged it and transferred the image to a solid state drive. Now I find (as of July 10th 2018) my Office Pro Plus 2016, Project Pro and Visio Pro are no longer activated, I ran your activation code again and I get the error message “Sorry, your version is not supported”, I am an independent consultant and need this software suite for work. PLEASE, PLEASE publish new working code so we can continue to work. Sorry but I cannot take you seriously with the name, ‘Buckyballs’. Uninstall and Reinstall again, then apply the procedures again. Keep the programs in the main Drive, probably that is C for you. 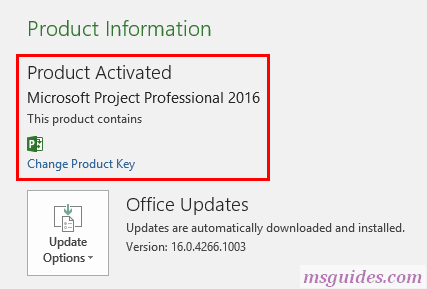 I tried with Project 2019 and after the script ran I said product activated, but when I checked it had not been, I tried another activation and this confirmed activated, but again when I checked it was not activated. It tried uninstalling and re-installing MS Project again, but it still did not work, I have used Proect 2019 Standard and Professional 64 Bit.